> > Read more about why “Mjøstårnet” is THE TALLEST TIMBER BUILDING IN THE WORLD. > > See the first of six films about "Mjøstårnet"
Mjøstårnet, named after its neighbour and Norway’s largest lake, Mjøsa. The record-breaking construction will sit on the edge of the north-eastern tip of the lake in the small town of Brumunddal, an hour and a half’s drive north of Oslo. Spanning over 18 floors, the building will reach 80 metres high, and include apartments, an indoor swimming pool, hotel, offices, restaurant and communal areas. Construction is scheduled to be completed in December 2018. Moelven, a Mjøsa-local Scandinavian industrial group, will supply the timber constructions from local spruce forests required to construct the tower and the swimming pool area. Arthur Buchardt states that he can evidence the climate friendliness of building with wood. 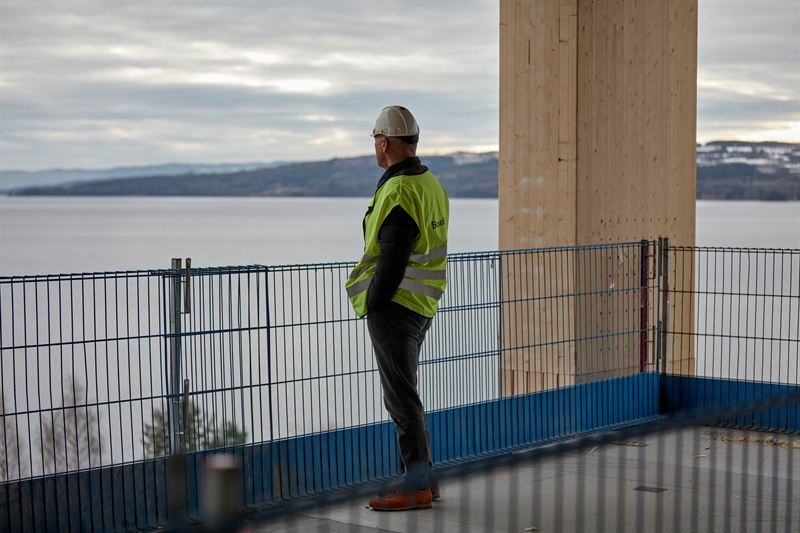 “A project group established by Norwegian road authorities investigated the possibility of building the world’s longest timber bridge across Lake Mjøsa. Their studies show that building with wood instead of concrete can reduce CO2 emissions by up to 30 percent,” says Buchardt. Buchardt believes that the construction sector will evolve in the footsteps of the automotive industry. Moelven industrier ASA is a Scandinavian industrial group that supplies products and associated services to the Scandinavian building market. The Group's businesses employ over 3.600 persons and have a total annual turnover of some NOK 11 billion. The Group's close to 52 business production units are organised into three divisjons: Timber, Wood and Building Systems.